Byzantium is what remains of the Eastern Roman Empire, and along with Trebizond and Theodoro, the last remnants of the once mighty Roman Empire. Starting with only two provinces in Southern Greece and Constantinople, as well as Athens as a vassal, its rebirth begins under the shadow of the Ottomans. It starts with the fabled city of Constantinople, one of the largest and richest metropolises in the world. Byzantium's missions are focused around reconquering the former territories of the Empire (including Italy and thus Rome), as well as a special mission to restore the Orthodox Pentarchy by converting all five major Christian cities (Constantinople, Antioch, Rome, Jerusalem, and Alexandria) to the Orthodox faith, which, upon completion, disables the Curia mechanics. Byzantine events revolve around the reconquest of key cities and regions in the empire. Others focus on the influence the Byzantine court had over the emperor, which can significantly boost Byzantium's monarch points. 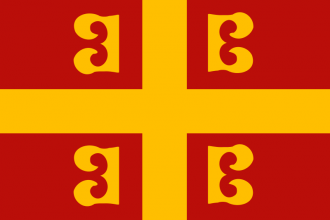 Byzantium can be restored by Orthodox countries with Greek or Pontic primary culture. The following decisions are part of the Purple Phoenix DLC. With the reconquest of Greece complete we can honor the victorious soldiers and generals with a triumphal march through the capital, a tradition that dates back to the earliest days of Rome. While defunct for many years, our phoenix-like rebirth seems like an apt time to restart it. The Purple Phoenix DLC is enabled. own at least 1 province of Morea or Northern Greece. Byzantium owns all provinces of Morea and Northern Greece. With the reconquest of the Balkans complete we can honor the victorious soldiers and generals with another triumphal march through the capital, a capital that is now secured from European threats. own at least 1 province of the Balkans. Silistria (159), Burgas (1764), Edirne (149), Tarnovo (150), Sofia (1765), Macedonia (148), Kastoria (1853), Vlorë (143), Zeta (138), Ragusa (137) and Dalmatia (136). Now that the Asia minor coast is secure, the capital is safe from eastward threats. The army deserves to march in triumph through the streets, and our generals must be commended. owns at least 1 province of Aydin or Hüdavendigar. Byzantium owns all provinces of Aydin and Hüdavendigar. The soldiers and generals that have secured Anatolia once again surely deserve the highest of honors! owns at least 1 province of Anatolia. Byzantium owns all provinces of Anatolia. Our generals have now exceeded even the great Belisarius by returning the whole of Italy to Imperial control, and so they must be awarded the grandest triumph the Empire has ever seen! owns at least 1 province of Italy (region). Byzantium owns all provinces of Italy (region). Have a good strategy for Byzantium? Preparing for war with the Ottomans In the beginning of the game, you need to acquire the right amount of allies that will make the Ottomans attack you, but will allow you to beat them in battle if you are careful enough. A useful strategy is to have an ally to the west of the Ottomans and to the east of the Ottomans. Get Wallachia or Serbia and Albania in the west, the latter is important when battling the Ottomans as the Albanians start with a 3 star general that will allow you to beat the Ottomans in battle. In the east you get Karaman, you can use them simply to divert Ottoman troops from your main land and to occupy territory in Anatolia. You could also try to make a royal wedding with Imereti, as their leader has no successor in the beginning and you will have a chance to get a PU junior partner in the early game. Unfortunately, they are not that useful when battling the Ottomans. Make sure you do not have too many allies, or else the Ottomans won't attack you, will get stronger by absorbing other territory and come back in much greater force. Next to being diplomatically active, push your military strength, and give your king a generalship, if he doesn't have any useful skills. Your successor is better than your king, and will allow you to develop faster in later phases. Pull your forces to Athens and set up a spy network in the Ottoman capital and wait for the Ottomans to attack you, as soon as you have acquired 3 allies positioned in the east and west. The first idea group you should get is defensive ideas, as it will give you benefits early on in the many wars you will go through, and later will reduce fort maintenance. War against the Ottomans Charge as soon as possible to the fort in Macedonia, while leaving one unit behind to occupy less important territory. Make sure, that allies can attach themselves to your main force. The Ottomans will be focused on occupying Constantinople, this will allow you to occupy Macedonia and their capital next to it. Be careful not to go into unnecessary battles with the Ottomans. The Ottomans quite often try to attack the land of allies after having Constantinople occupied, use that time to take it back. If all works well, you'll have lots of territory occupied in the west and the east, most importantly their capital and a war score of 20-40 %. This would be the moment to bargain for peace with the Ottomans and retake some of your cores. Be sure to NEVER take their capital, as long as it is on the European mainland. The position of the capital in Erdine is crucial to get war score to win future wars against the Ottomans. You counter the Ottomans by using the strategy of occupying their capital, but not taking it. Instead you get every single other territory you can get. A good strategy is to encircle Erdine and get Kocaeli, Hüdavendigar and Biga. When you are at this level, your navy should be stronger than the Ottoman navy, and you will easily beat them step by step. During the course of time the Ottomans will also be weakened by war with their neighbouring Nations especially with the Mamluks. Between the Ottoman wars Keep an eye out for Serbia, Venice, Moldavia, and Hungary. After the first Ottoman war you should have retaken Epirus, allowing you to generate a claim on their mainland. If you are lucky, Venice will try to attack Serbia to take Zeta as well. If Serbia isn't your ally, attack them as well and vassalise them as soon as their war with Venice has stopped. If they are your ally, you should be able to beat the Venetians with Bosnia and Serbia as your ally in the war. This will allow you to gain some land of the Venetians or vassalise Serbia. If you are really lucky, Moldavia will be allied with Serbia in the war against Serbia. You can easily beat them with the Wallachian forces and take two of their provinces neighbouring Wallachia. This will be important in the future. As your goal should be a vassalisation of Wallachia. There will come a moment where they will break their alliance with you and attack you to get some of the formerly Moldavian land. Use this war to vassalise them. By that time, you should be strong enough to get Hungary as a new ally, make sure you annex Athens in the meantime, and that you still have an ally in the east of the Ottomans. When Karaman is gone, Georgia will usually do the trick. You shouldn't care about having one diplomatic relationship too much. Continuous strategy Steadily use this tactic of acquiring new allies, attacking the Ottomans. Always keep an eye out for nations that could be vassalised, attacked to get a claim on an other nation of interest later on, or become a new ally. Muscovy will soon emerge as a nation that is quite fond of you and willing to ally itself with you. Keep an eye out on Crimea. Genoa will wage war on Crimea, but will also have trouble keeping those provinces. If you have a claim in Crimean land, while Genoa is at war with Crimea. Attack Crimea, vassalise them and use this to get into a defensive war with Genoa. Soon, you'll have land on the Italian north. ↑ The script code of these events can be found in /Europa Universalis IV/decisions/Purple_Phoenix_decisions.txt.